This is a naan-believable no-look backhand of naan dough across the restaurant in Tamil Nadu, India! Just a flick of the wrist sends the dough to a partner who catches it, and then bakes it in the open oven for restaurant patrons. After the shocking news about Hello Kitty, the Indianapolis AlleyCats revealed they, too, are not cats. This announcement by the AUDL team has confused Indy fans who have enjoyed the teams's feline puns ("claw our way to the Championships") and the past whisker promotion. From the Indianapolis statement: "AlleyCats are not cats. They are a friend. But they are not cats. They are never depicted on all fours." Experts encourage fans of the Indy AlleyCats to seek support through social media channels to express themselves. The Top-8 club Ultimate teams from each division meet this weekend at USA Ultimate's Triple Crown Tour 2014 Pro Flight Finale event. A total of 24 teams visit Burlington, Washington, over August 30-31. This event was originally scheduled for California, but moved to the Emerald City Classic tournament. NGN offers the live-stream of games for the price of $5 per game, or a $15 package for all 8 games. Of the 72 total tournament games, 8 games (11.1%) will be covered — 4 from men's division, 4 from women's division. No mixed division games will be covered. NGN's campaign to add just one mixed game to their Pro Flight Finale coverage failed to meet its fundraising goal of $2700. According to Ultimate Australia, the UniGames will replace the mixed division with a men's and women's Ultimate division in 2015. Ultimate has been an event at the Australian University Games since 2005. Only a mixed division was offered for the past ten years. Australian University Sport and Ultimate Australia are pleased to announce that the Ultimate competition at the 2015 Australian University Games, on the Gold Coast, will move from a mixed competition to a men's and women's competition. The development of the sport within the university sector has seen a marked increase in female participation and both Ultimate Australia and Australian University Sport have been working to achieve the goal of staging a men's and women's competition for a number of years. "Ultimate Australia have been working to specific gender balance goals over these past years and as we move towards our 2016 participation targets, we are excited that we can now offer a stand alone men's and women's competition. This is great for the sport and of course the players" says Simon Wood, CEO of Ultimate Australia. 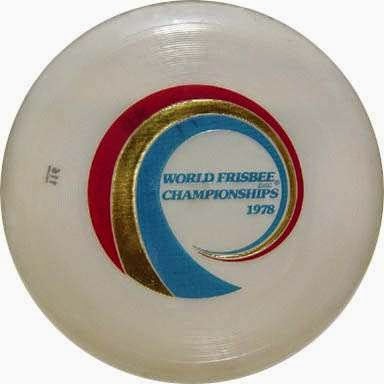 The finals of the 1978 World Frisbee Disc Championships (WFC) were held at the Rose Bowl in Pasadena, California. Thirty-six years ago! Ultimate was not played [watch here], but other popular disc sports of the times were, such as: Disc Golf and Freestyle. The much smaller font for the word "disc" is most likely due to the event being a promotional event by Wham-O, who only sold Frisbees. 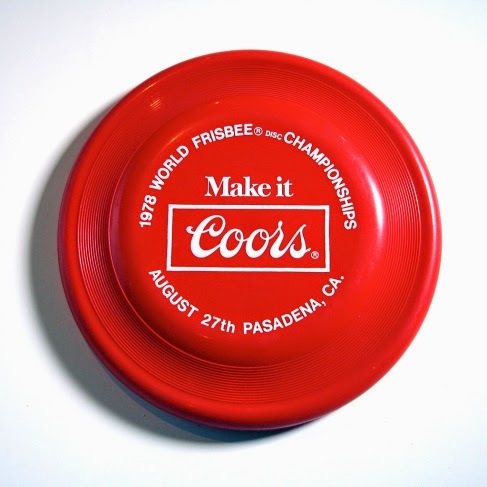 Coors Brewing Company, as a sponsor of the WFC event, distributed these branded Frisbees to attendees. Sunday, August 27th, was the last day of the 3-day event. 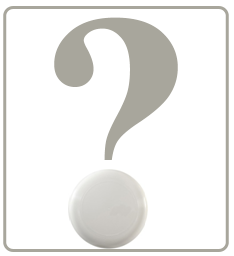 Check out this Ready-for-the-Pull button on the airplane! An Ultimate disc is in my carry-on, but the seat belt requirement is going to make it difficult to get seven on the line. How do I get the attention of the flight attendant to discuss? Pittsburgh Thunderbirds - one of American Ultimate Disc League's expansion teams - unveiled their team logo last week. The black and gold colors are congruent with Pittsburgh sports teams. 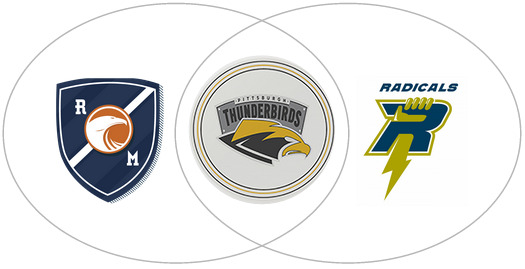 The logo seemingly borrows from 2 existing AUDL teams – lightning bolt from Madison Radicals and the bird profile with hook-like beak similar to Montreal Royal. This goes beyond gym class offering Ultimate Frisbee. Text from the article "VPA to Add Ultimate Frisbee for 2015" by Greg Fennell. Ultimate Frisbee in Vermont is getting the ultimate reception: official recognition from the state's governing body for high school athletics. The field sport that uses the trademarked disc for a ball and employs elements of football, soccer and basketball in its play will be an exhibition sport for the next two years, starting next spring, Vermont Principals Association associate executive director Bob Johnson announced during Thursday's annual media day at the VPA's Montpelier office. At least 13 schools have said they'll take part in the endeavor, which could be elevated to full state sanctioning as early as 2017 if ultimate can meet a number of mandates. "It's absolutely amazing how many kids are involved," Johnson told the gathering of about two dozen media members. "Down here in Montpelier, they’ll tell you they have somewhere between 50 and 60 kids that play ultimate. … Some of these nontraditional sports that we've seen in the past few years have just completely grown in popularity." Vermont is the first state in the country to support ultimate in this manner, according to Montpelier High coach Anne Watson, one of the forces behind VPA sanctioning. Watson estimated the first spring league could encompass between 16 and 20 schools. ... Johnson said a group representing ultimate made its first serious pitch to the VPA's activities standards committee in February. He called it "probably the best presentation that I've ever seen on an exhibition sport." "They brought in about 15 students from various schools in Vermont — Montpelier, Fairfax, CVU, schools down south; they brought them in from all over," Johnson said. "They also brought in seven or eight coaches and sat there and explained to us what ultimate was. It was just an excellent presentation." Ultimate also has carved out a niche as an antiestablishment team game. Some contests are played to a certain score rather than with timed periods. Many levels of the game are played without referees, with the competitors policing themselves. Johnson said an ultimate committee will begin meetings this fall to plan for the sport's future. The group, made up of coaches and athletic directors from ultimate-playing schools, will be in charge of writing the sport's rules if the game is to achieve full VPA sanctioning. "They came to us and said, 'We need to have some sort of body under which we come under, an umbrella type of body,' " Johnson said. "'We need a body that will establish formal rules and regulations because we’re growing so much. Plus, we have all these high school kids that are participating.'" "When they come under the VPA's umbrella, with any sport, what happens is you've agreed to abide by our rules. That means you're going to have rules, number one, which a lot of people look at ultimate and say, 'Really?' "
"People play ultimate because it's relaxed. That's sort of the appeal. I'm in favor of whatever the kids want to do." Ultimate’s biggest challenge will ultimately be getting out the word. The average rating for the sport of Ultimate by survey participants was 70.03, placing 3rd on the ESPN list - behind boxing [1st] & ice hockey [2nd]. (Soccer is #10 on the ESPN list.) The top five skills for Ultimate were: Agility, Speed, Hand-Eye Coordination, Endurance, and Analytic Aptitude. Twice, Ultimate ranked higher than ESPN's top-rated sport in the categories of Agility (besting soccer), and Analytic Aptitude (besting soccer, ice hockey and auto racing). 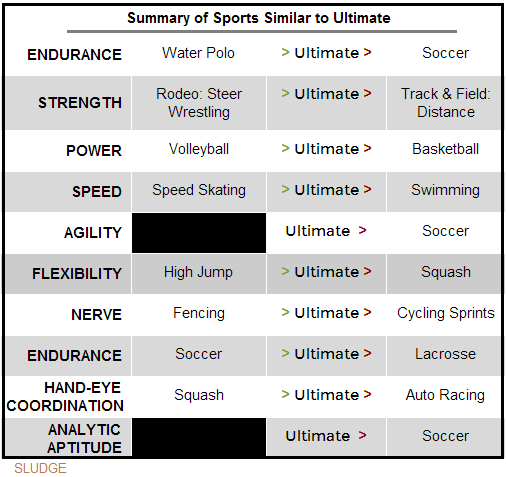 Ultimate was ranked within the top 15 of each skills category, except in: Strength, Power, Nerve, and Durability. Survey rankings within each skills category. Endurance: Ultimate is between water polo and soccer at 7.86. 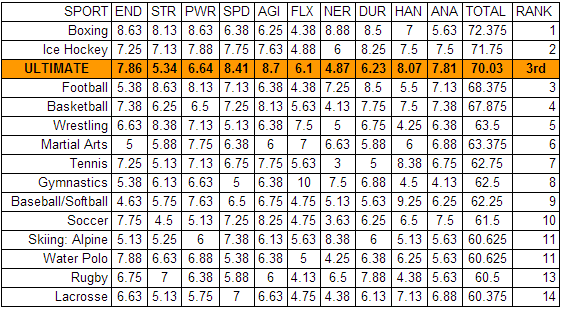 Strength: Ultimate is between rodeo and track and field distance at 5.34. Power: Ultimate is between volleyball and basketball at 6.64. Speed: Ultimate is between speed skating and swimming at 8.41. Agility: Ultimate is higher than soccer at 8.7. Flexibility: Ultimate is between high jump and squash at 6.1. Nerve: Ultimate is between fencing and cycling sprints at 4.87. Endurance: Ultimate is between soccer and lacrosse at 6.23. Hand-Eye Coordination: Ultimate is between squash and auto racing at 8.07. Analytic Aptitude: Ultimate is higher than soccer, ice hockey, and auto racing, at 7.81. Averaging all submitted responses resulted in Ultimate placing 3rd on the list – behind Boxing (1st) and Ice Hockey (2nd). An eight-person panel of experts rated ESPN's sports. 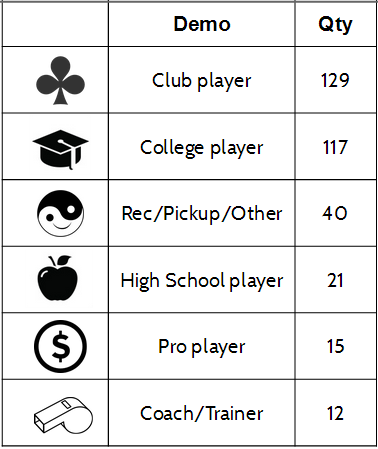 A total of 334 online survey participants provided ratings for the sport of Ultimate. Nearly three-quarters of participants identified themselves as club or college players. LOCATION: Most were from United States (72%) & Canada (14%), with additional participation from Australia, Austria, Belgium, France, Germany, India, Ireland, Italy, Malaysia, Netherlands, New Zealand, Serbia, Singapore, Slovenia, South Africa, Spain, Turkey, United Arab Emirates, & United Kingdom. AGE: Ages ranged from teenagers to over 50, with the majority (~71%) were between the ages of 19 and 28. As noted in the published text, a bias exists since the survey participants were also involved in the sport. Full Report: Download & Read the Survey Results. In April 2004, ESPN published their measurement and comparison of 60 sports. 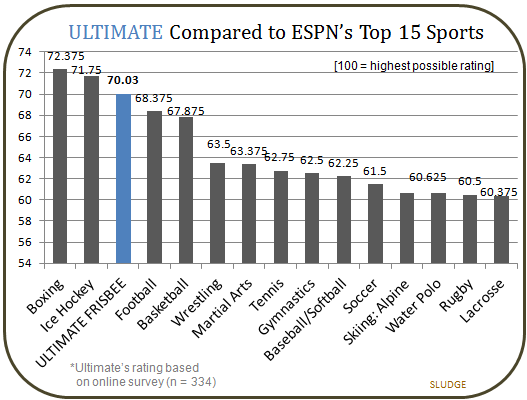 Sixty sports/activities were reviewed by the ESPN panel in ten categories; Ultimate was not included. To pile on, ESPN named their results output as the "Ultimate Degree of Difficulty Grid." 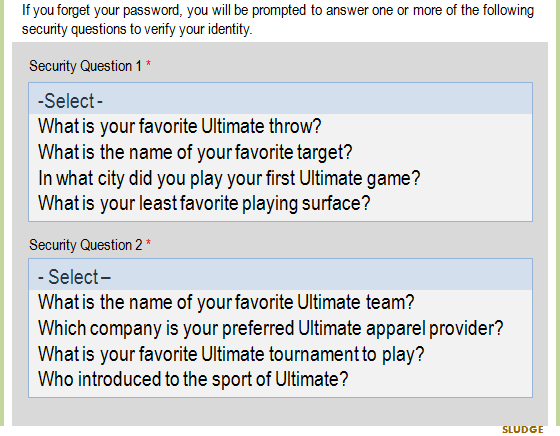 So, SLUDGE spearheaded a survey project to help answer the what-if question of: where would the sport of Ultimate be ranked? The SFIA (formerly SGMA) Report categorizes Ultimate Frisbee as a "team sport." "Ultimate: The Greatest Sport Ever Invented By Man" is the title of Tony Leonardo's excellent book. Mike Payne, President of USAU Board of Directors, is quoted: "The USOC...relationship...validates ultimate as one of the nation's emerging sports." And, sometimes, it's just easier to describe Ultimate in the context of other sports. Thank you to everyone who participated in this survey. This project could not have been accomplished without the support of the Ultimate community – local and worldwide. Special thanks to Ultiworld. Much appreciated! A chart and Ultimate Frisbee! YEAH!!! A bad chart design and ultimate Frisbee. BOOOO!!! This percentage chart that SB Nation posted is sketchy because it does NOT cite its sources of the data, NOR its sample size. 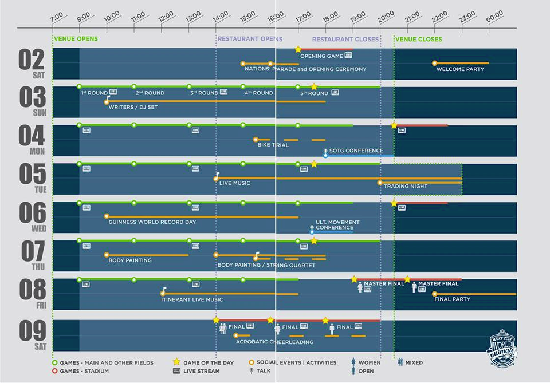 Don't trust a chart like this. What is the data source???? 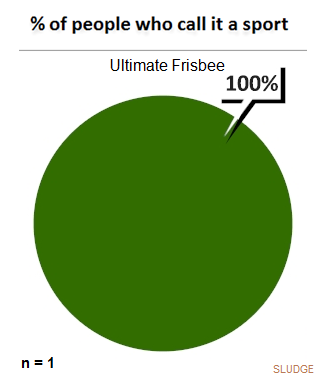 The unsubstantiated chart reveals 80% call Ultimate Frisbee a sport. Just seeing that percentage - the sample size might be just 10 people. So, 8 out of 10 "people" "call" ultimate Frisbee a "sport." 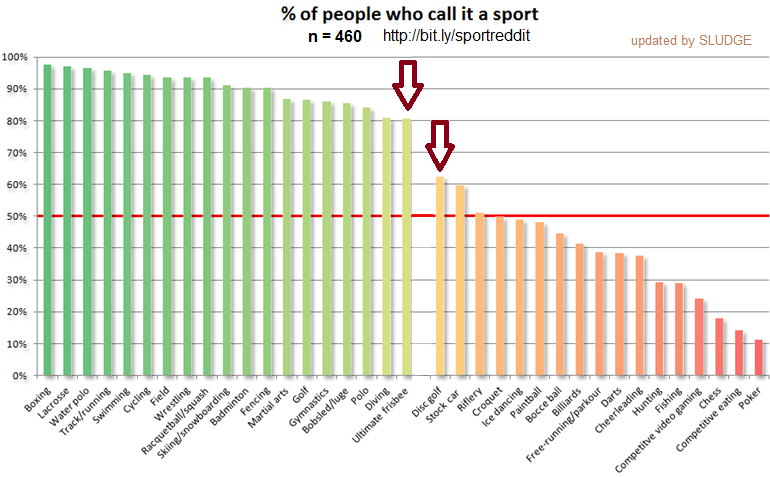 Also, over 60% of "people" "call" Disc golf a "sport." How reliable is this chart without knowing this important piece of data? Here's a chart that is more useful than the worthless chart SB Nation posted. Updated chart with proper data sourcing (& highlighting disc sports). 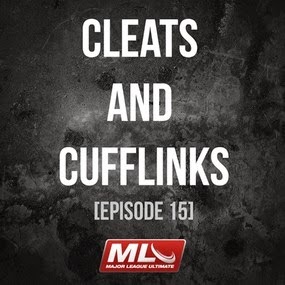 In episode 15 of Major League Ultimate's podcast, Cleats & Cufflinks, it teases a few items about their 2015 pro Ultimate season. Fast-forward to around the 50-minute mark to get the limited scoop on next season. 1. Regular season: may expand to 12 games, from 10. 2. Start of season: may start later; away from mid-April. Past season started on April 20 (2013) and April 12 (2014). 3. MLU Championships: may move to August; away from July. Past games have been on July 13 (2013) and July 19 (2014). 4. Inter-league: No plans to have the Eastern & Western Conference teams play each other during the regular season. 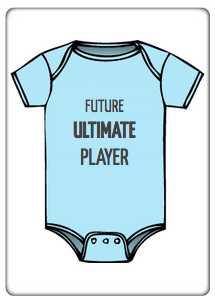 Naming your offspring is like choosing an Ultimate team name - both can be stressful decisions. One is a slightly bigger deal than the other. Since we can't help with the more stressful one (team name), check out our list of Ultimate-related names for your baby &/or babies. Have more? Let us know & we will add to the list! 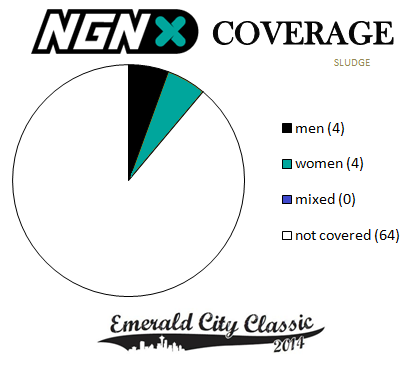 NGN is scheduled to broadcast 8 Emerald City Classic games over August 30-31 in Burlington, Washington. The $15 package provides access to all games of this Pro Flight Finale event of the Triple Crown Tour. Per a Facebook posting: "NGN plans on piloting a program where teams will get a percentage of proceeds from video purchases by their fans." This revenue sharing model appears similar to how ultimate apparel companies have established team shops. (Examples: DC Scandal, VC Teams via VC Ultimate.) So, you can watch ultimate games and also support them - all at the same time! 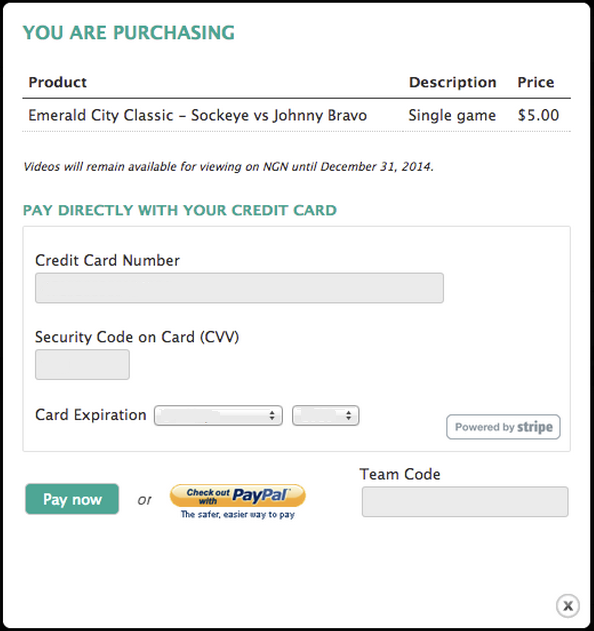 Screengrab of "Team Code" box on NGN payment page. AUDL announced a new pro Ultimate team in Nashville, Tennessee. The "NashVegas" team has been named NightWatch, and expects to join the eventual Southeast Division in a to-be-determined future season - either 2015 or 2016 - of the American Ultimate Disc League. Look’t here! Ottawa has been reported to be a new pro ultimate team in the AUDL. The capital of Canada, located in the Ontario province, would be a new addition to the planned AUDL expansion list. The AUDL has yet to formally announced this team will join in 2015. If true, an The Ottawa team would be is Canada's fourth AUDL franchise, and the second AUDL franchise in Ontario. ...And at the league playoffs (August 23-24), Ottawa Carleton Ultimate Association is planning to announce that Ottawa will soon have a professional team in the American Ultimate Disc League. The rapidly growing league has expanded from eight clubs three years ago to 22 next season, including major U.S. cities like New York, Detroit, Chicago, Philadelphia, San Francisco and San Jose. Ottawa will be the fourth Canadian franchise, along with Toronto, Montreal and Vancouver. "Despite that," says Marceau, “the professional leagues have been growing. They’ve created a visibility for the sport that is just unreal." Marceau says Montreal's first home game last year drew 2,500 fans. She and other Ottawa officials are still scouting possible venues for Ottawa's team. Announcements about ownership, the team's name, the coaching staff and player tryouts are expected in the weeks ahead. The season will run from May to August next year." The number of Ultimate games covered (22) in Lecco was similar quantity to 2014 Major League Ultimate broadcasted games (25). However, the percentage of WUCC was low (3.25%), while the MLU percentage was over 50%. Obviously, the logistics are different for streaming in Italy than it would be in North America, as well as, capturing tournament games versus one match. The 2014 MLU regular season had 40 games, plus 3 post-season games. All but one of MLU's broadcasts were via MLU Live. 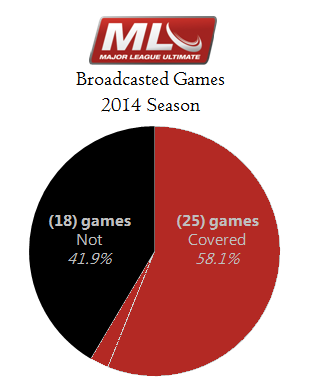 Overall, MLU covered nearly 60% of their pro Ultimate games in 2014. 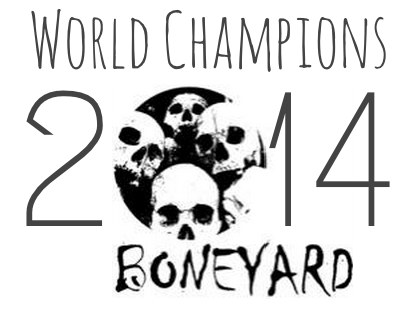 Skyd Magazine provided exclusive broadcast coverage of the 2014 World Ultimate Club Championships from Lecco, Italy. Skyd's final schedule covered 22 games across all five divisions. 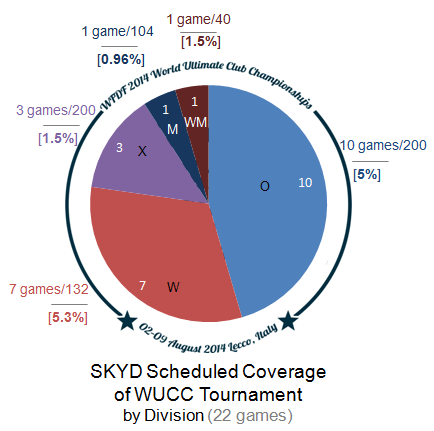 In all, Skyd's broadcast covered just 3.25% (22 streams / 676 total games) of WUCC games played. Put another way: 96.75% of WUCC games were not streamed. The above chart shows the percentage of each division's streamed games compared to the total number of game each division played. The 7 Women's division games led by percentage (5.3%) while Open's games topped in quantity. The lone Women's Masters game (which was added late to the schedule) represented slightly more coverage by percentage than the 3 Mixed games. Masters was the least covered by percentage with 1 game. This is not a knock against Skyd. How lucky are we to connect into this mountain village to remotely watch ultimate games?! If you were fortunate enough to spend time with any of the Skyd streams, you know the commentators, Bryan Jones & Liam Rosen, were well-prepared and called every game professionally. Check out Skyd's archive. Thanks also to the additional crew who manned the cameras, set up audio, cued replays, posted on-screen notifications regarding calls and coordinated streaming logistics. The World Flying Disc Federation's World Ultimate Club Championships is a huge event – 161 teams [Open (48); Women (32); Mixed (48); Masters (24); Women's Masters (9)] – across 5 divisions with a total of 676 games. Coverage of such an Olympic-sized sporting event is a massive undertaking. MASSIVE! This lack of overall video reporting is an issue for Ultimate if it ever wants to become a household sport. I want moving pictures of game clips at my fingertips - to watch and to share. And, to re-watch and to re-share. One could argue that any one division should be covered more. Really, let's take a step back. Ultimate - as a sport - has a general coverage gap. I am not advocating that every ultimate game everywhere needs to be fully broadcast. Just a daily recap with game clips seems like an attainable standard for elite tournaments. Without any daily video(s) feels like a missed opportunity. It was just last year when the ultimate community pooled its resources together to fund the broadcasting of 100% of ultimate matches at the World Games. Tournament hosts should prepare their event accordingly knowing there is a viewership market and viewer demand. Bottom line is when an athletic showcase - like a WUCC, or any Triple Crown Tour event - is scheduled, then the proper resources must be dedicated to video capture our sport. Ultimate deserves it. The players deserve it. And, the fans deserve it. D.C. Scandal entered the World Ultimate Club Championships as the #1 seed and competed with the top 32 women's ultimate teams from around the world. This international sporting event, occurring every four years, organized by the World Flying Disc Federation. This year's event in Lecco, Italy, started on August 2 and ended on August 9. Scandal placed third with a victory over Texas Showdown, earning Washington DC's elite women's ultimate team a bronze medal. Overall, Scandal finished the tournament with an (8-1) record. Their only loss was in the semifinals versus Seattle Riot, who ended up winning the women's division. Playing 9 games in 5 days, Scandal had an excellent tournament going undefeated through their first 7 games. 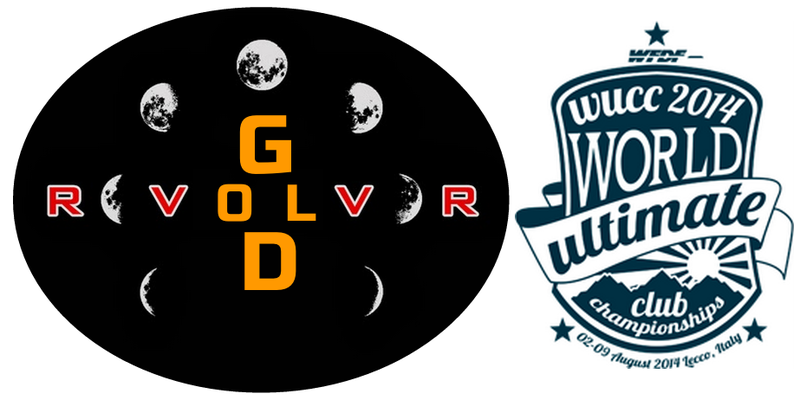 Congratulations to the teams that won gold at the 2014 World Ultimate Club Championships! OPEN: San Francisco Revolver won 17-15 over Seattle Sockeye. Johnny Bravo won 3rd place. WOMEN: Seattle Riot won 17-15 over San Francisco Fury. DC Scandal won 3rd place. MIXED: Drag'N Thrust won 17-10 over Bay Area Polar Bears; The Ghosts from Boston won 3rd place. MASTERS: North Carolina Boneyard won 17-8 over Calgary Figjam. Denver/Boulder's Johnny Encore won 3rd place. WOMEN MASTERS: Montreal Vintage won 17-13 over Boston Godiva. Germany's Golden Girls won 3rd place. 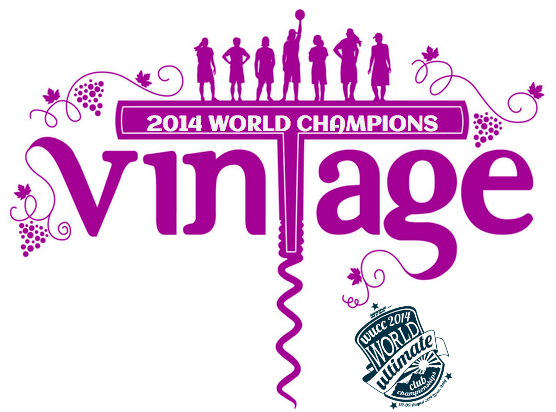 There were 40 countries represented at the 2014 World Ultimate Club Championships in Lecco, Italy. 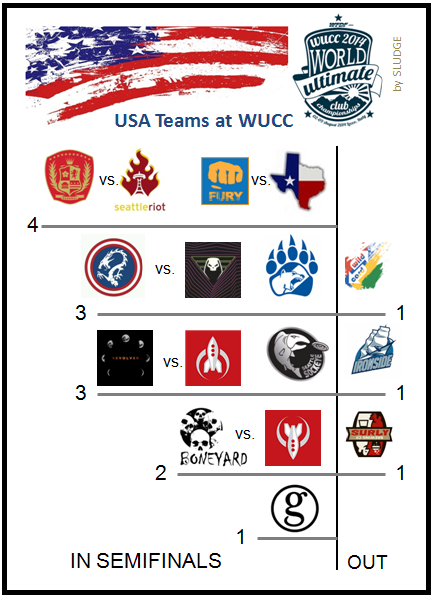 After pool play, 14* different countries - across all divisions - advanced to the WUCC playoffs. 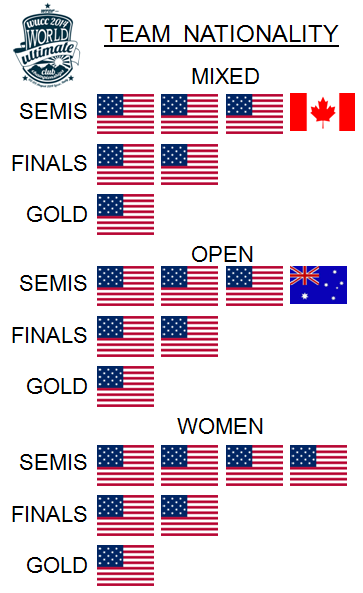 By the semifinals, only 5 countries were represented - Australia, Canada, Germany, Japan, and U.S.A.
By the finals, only 2 countries were represented - Canada and USA. *The 14 countries = Australia, Canada, Colombia, Denmark, Finland, Frane, Great Britain, Germany, Italy, Japan, Russia, Singapore, United States, and Venezuela. After four days of competition in Lecco, Italy, for the World Ultimate Club Championships, the field of 48 international women's teams was reduced to 8 playoff teams, and now, just 4 remain – all teams from the United States. 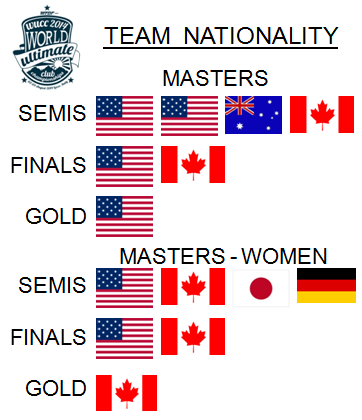 USA was represented in the women's division by these four teams at this international tourney. These elite women's ultimate Frisbee clubs from Washington, D.C., San Francisco, Seattle, and Texas earned their bids from winning at 2013 USA Ultimate National Championships. 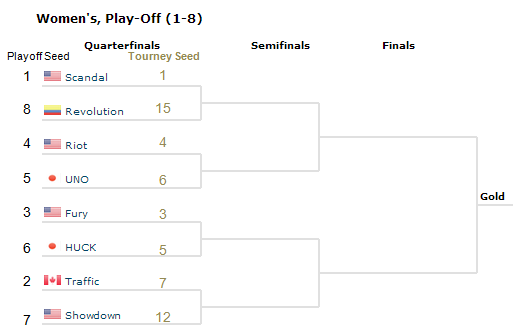 Scandal was the #1 seed, with Fury at #3, Seattle #4, and Showdown #12. 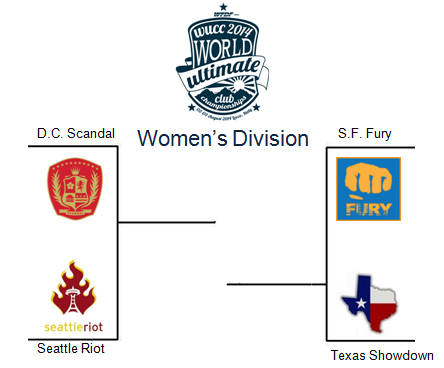 DC Scandal, Seattle Riot and San Francisco Fury all enter the semifinals undefeated at (7-0). In goal differential, Scandal leads (+63), followed by Fury (+58), then Riot (+46). Texas Showdown has a (5-2) overall record. 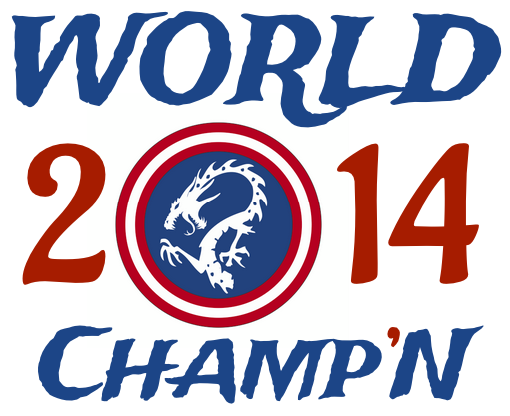 A total of 16 club teams from the United States are at the 2014 World Ultimate Club Championships. Here's a current snapshot of the current status of U.S. club teams. All 16 U.S. club teams advanced to the WUCC playoffs. All 4 of the U.S. women's club teams advanced to the semifinals. 10 of the 13 teams in the semifinals are playing against a team from the U.S. 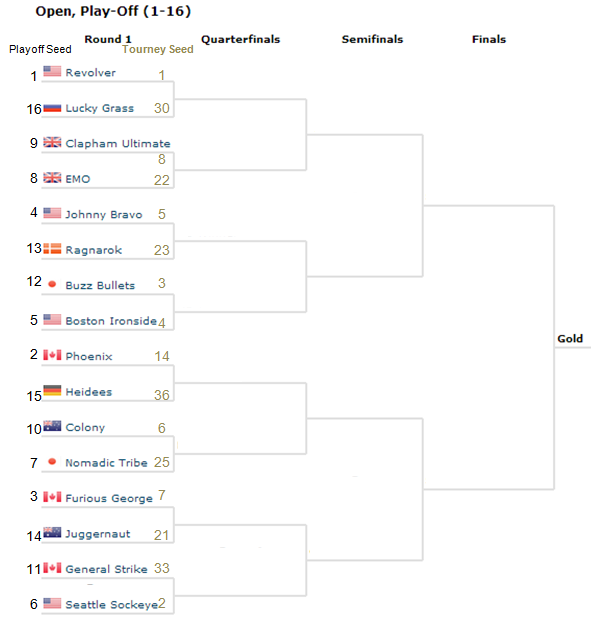 The 8-team playoff brackets are set for the World Ultimate Club Championships. 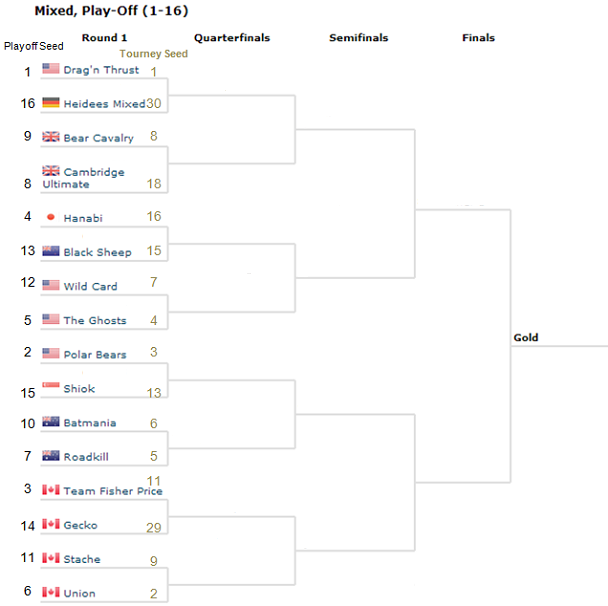 The 16-team playoff brackets are set for the World Ultimate Club Championships. 7 teams broke seed to advance into the Top-16. 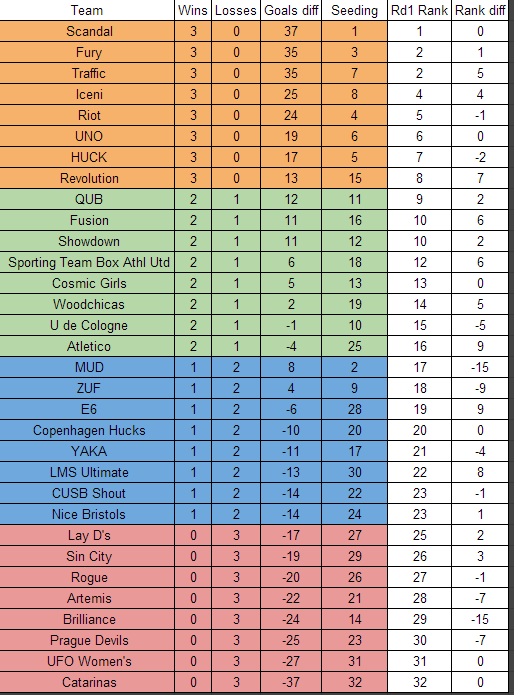 With the first round of WUCC pool play completed in Lecco, here's a snapshot of how teams performed based on Wins/Losses, goal difference and then ranked to provide a comparison to their tournament seed. Top-seeded Scandal (USA) posted an undefeated record and highest goal diff to be ranked #1. Drops: MUD (JPN) [#2 seed] & Brilliance (RUS) [#14 seed] both dropped 15 spots. Jumps: Atletico (FIN) [#25 seed] & E6 (SWE) [#28 seed] both jumped 9 spots. 5 teams had no change in rank, compared to their seeding. Top-seeded Drag'n Thrust (USA) posted an undefeated record, though 2 other teams - Polar Bears (USA) & Black Sheep (AUS) - posted higher goal diffs to be ranked #1. Drops: Hippo (AUS) [#10 seed] down 24 spots & 7 Bees Ultimate Team (BRZ) [#26 seed] dropped 21 spots. Jumps: Macondo (COL) [#44 seed] went up 22 spots & Junk (HKG) [#47 seed] jumped 19 spots. Only 2 teams had no change in rank, compared to their seeding. Top-seeded Revolver (USA) posted an undefeated record, though 6 other teams posted higher goal diffs, for Johnny Bravo to be ranked #1. Drops: Magon (AUS) [#16 seed] down 23 spots & Mojra (POL) [#26 seed] dropped 20 spots. Jumps: Tchac (FRA) [#40 seed] went up 28 spots. All 48 teams changed in rank, compared to their pre-tournament seeding. There is more than just ultimate games happening at the World Ultimate Club Championships in Lecco, Italy. 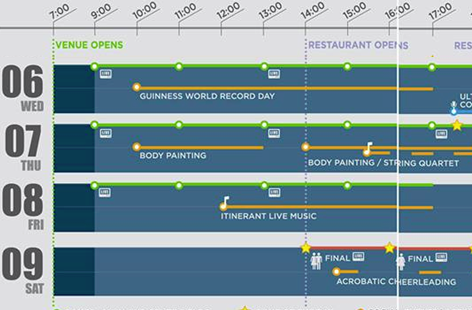 WUCC's Event Program posts daily social events throughout the tournament. Thursday, August 7: Body painting in the morning. But, wait, there's more! The mixing of body painting AND a string quartet.